Tired of living in a do-nothing house? One that just sits there when you're not around? How about a house that's like something alive, that reacts to its environment, that improves its environment, even. This is the Jellyfish House (pictured left), whose sinuous, cellular skin swells as it fills with rainwater and 'gray water' for use in the home. The house purifies water using UV light, whose harmful rays are screened by a coating of titanium dioxide, allowing the house to glow with a calming shade of blue. "I don't know if I want to live in that exact house," says Lisa Iwamoto, whose firm IwamotoScott designed it. "We were more interested in technological developments than comfort." The San Francisco firm, which does design real buildings for real people, has won fame for its more speculative endeavors, which include plans for a post-climate change San Francisco. 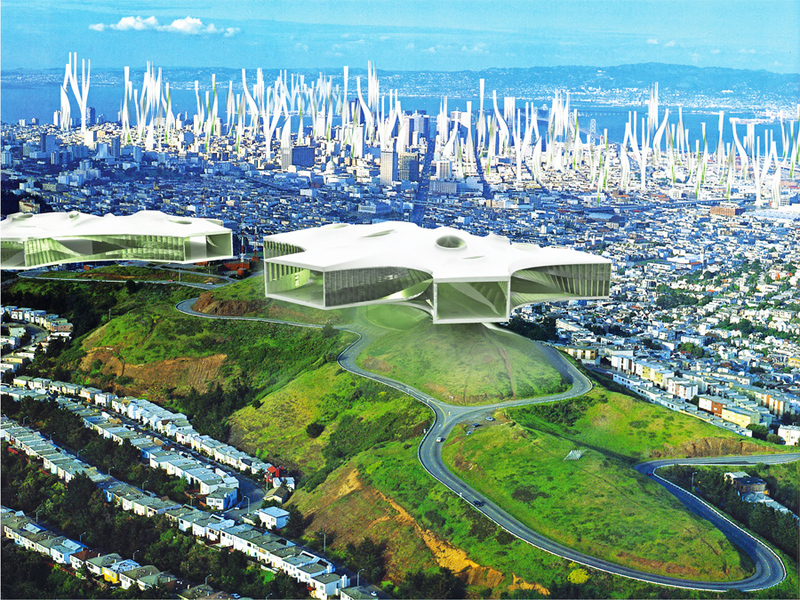 In this San Francisco of the future, dubbed Hydro-Net (above), tendril-like towers will wave in the breeze and hydrogen produced by algae will fuel flying cars that speed through underground passageways. "All architecture is a little bit visionary because all architecture is planning for the future," Iwamoto says. 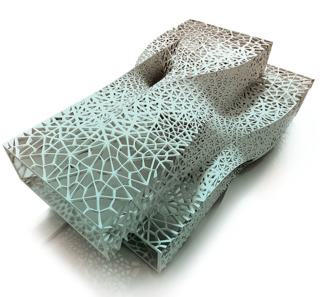 "But visionary architecture is looking at a more distant future and is more speculative." 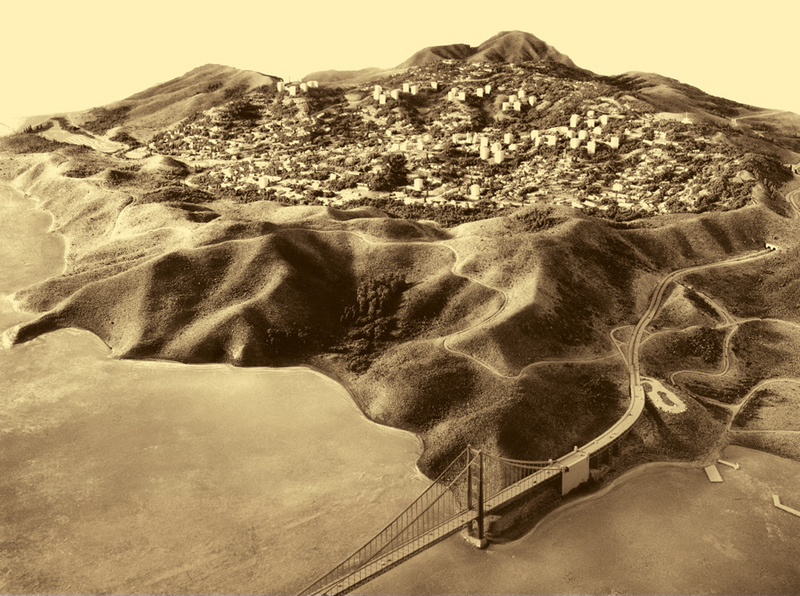 During the late 1960s and early 1970s, several proposals were floated for remaking Alcatraz, what has since become the Bay Area's favorite ghost town. One plan called for a space museum featuring statues of astronauts, along with a reconstruction of San Francisco from the Gay 'Nineties. The flashiest plan, pictured here, came from San Francisco architect and artist Ernest Born, working with developer Charles Teischmann. They promised "a place of singular beauty to set the mind and heart free—the International Cultural Center and Hotel, destined to become a world-famous landmark, homes and apartments, unique shops and restaurants, sheltered courts, and children's play area." Born's drawings suggest an Italian town rising from the sea, with a few Japanese roofs for an Eastern touch, plus glass-walled houses projecting over the waves. Just a bit of the prison would have remained—the walls that lead from the landing to the top of the Rock. Al Capone would no longer have felt at home. It would have been the premier neighborhood in Northern California, occupying what developer Thomas Frouge called "probably the most beautiful location in the United States for a new community." Marincello, as Frouge called it, for "sea and sky," would have been a new city for up to 30,000 people, with glass-walled homes, townhouses, and high-rise apartments up to 16 stories tall. Today, visitors call the neighborhood the Marin Headlands, home to deer and bobcat, horsemen and hikers, most of whom shudder when reminded how close Marincello came to being built. One who does not is Tibor Fecskes, Marincello's project architect. "That was a fantastic project, incredibly complex," he says. Fecskes, who was the chief designer of the Summit, Eichler's high-rise atop Russian Hill, did the master plan for Marincello and designs for many buildings, all in a modern mode. 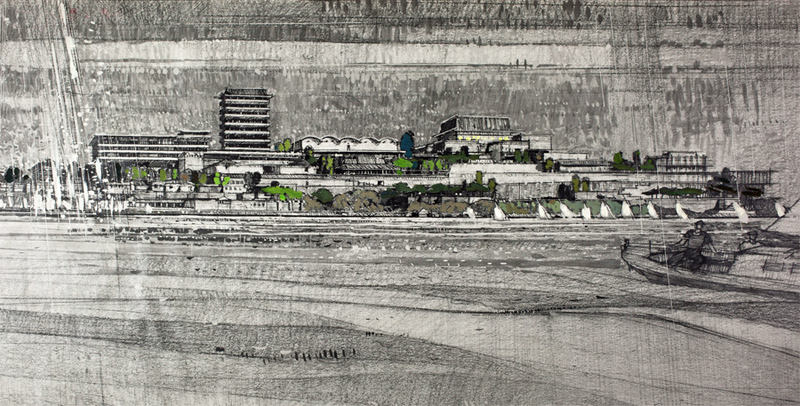 Marincello, proposed in 1964, would have included internal greenbelts and lagoons. It would have occupied most of the Headlands, including the hills facing San Francisco, but not Rodeo Lagoon nor Rodeo Beach nor the hills just north of the beach. Those areas would have remained state park. Theaters, boat rentals, a beer garden, and areas for light industry and international firms would have rounded out the community. Alas, despite the approval of county supervisors, Sausalito fought the plan, as did environmentalists. And Gulf Oil, owner of the land, pulled out. Frouge died shortly thereafter, Fecskes says, of a heart attack brought on by disappointment.